A Weekend Of Romantic Movies.. | Tell Me… Am I From This World? A Weekend Of Romantic Movies.. I have watched Serendipity more than a dozen times but it still makes my heart burst with emotions and my eyes teary.. It is just simply so endearing..
Is it true that we do have this certain person we are destined to be with? A soul mate per sé? While growing up, I have seen several movies about finding your destined one and I guess my choice for films falls into that category they call ‘chick flicks’.. Movies made to appeal more to women than men because of plots about forever love, meeting your soul mate and making you complete.. Hehe.. Is it so Jerry Maguire-y? It might have been a cliché but they never go out of style you know.. This rainy weekend was spent on movie marathon, particularly to romantic films like Notting Hill, Serendipity, The Notebook, et al.. Though most of them I’ve already seen a couple of times, I still enjoy watching them again and feel the love and emotions they bring.. Those classic lines spoken by the characters where we always find ourselves immersed and can relate to..
First on the list is, again, Serendipity.. Kate Beckinsale and John Cusack playing as Sara and Jonathan who accidentally chose the same black cashmere gloves during a Christmas shopping at Bloomingdales.. It might sound so utterly uncommon for fate to play that kind of game to two people but still, thinking that somewhere, in some place out there, there is someone that is destined to be with you and the whole universe conspired for you to be together (Hehe.. That’s a Paulo Coelho line!).. Next is, Notting Hill.. A classic plot of a rich and famous actress named Anna Scott, played by Julia Roberts, who fell in love with an ordinary English guy William Thacker, played by Hugh Grant.. Another hackneyed plot used for most romantic films and dramas but still enough to catch our attention and feel in love.. Anna who accidentally (again!) met William while checking out Notting Hill and had to face the difficulties of their relationship — a boyfriend who suddenly visited her, being discreet to escape the eyes of media and overcoming their own differences..
We all know what’s the ending of the film.. But we still waited for those heartfelt dialogues and those melting stares.. We were still awed when Anna told William, when she thought that it was end for both of them, that unforgettable line — “And don’t forget, I’m also just a girl, standing in front of a boy, asking him to love her..” That line made us all cry as if Anna begged William for the last time but then willing to let him go.. Eventually, their love surpassed everything and they still got together and created their own family..
Now, we have The Lake House.. A remake of a 2001 South Korean film Il Mare about a love between two people two years apart.. It starred Sandra Bullock as Kate Forster living in 2006 and Keannu Reeves as Alex Wyler in 2004.. I loved the Korean counterpart so much so I checked this out for the first time.. If you are not familiar with the theme of the movie, you might get confused on how the story starts.. The exchange of scenes from Kate’s time going back to Alex’s was not revealed at first.. But then again, the overlap of time for those two people and their possible communication through the mailbox at the lake house made it all so romantic and dream-like.. You would want to glue your eyes to the screen and wait for the next scenes if they’ll be able to overcome the twist of time.. They exchanged letters through the mailbox, known each other more.. Alex who is now in love with Kate and had seen her a couple of times, is determined to make it work for both of them.. Kate on the other hand, who works as a doctor, easily forgets the faces of those people she encounters, and has forgotten that she had seen Alex a few times already..
Well, because of Alex’s impulsiveness, he met an accident where he lost his life on Valentines Day of 2006 and it was Kate who attended to him at the time of accident.. Because of that, Alex wasn’t able to meet up with Kate at Il Mare restaurant in March 2006.. Kate thought it won’t work out so she decided to end their communication.. After two years, in 2008, Kate decided to hire an Architect to renovate the house she and her fiancé bought.. They hired Alex’s brother and found out that it was Alex who died two years ago on Valentines Day..
Kate immediately went to the lake house to send a letter stopping Alex to go to Daley Plaza that day and informed him to just wait if he cares for her.. And that she will be at the lake house in 2008 and will be waiting for him.. At last, they crossed the boundaries of their times and met each other..
An all-time classic, 1987 film, Dirty Dancing starring Patrick Swayze as Johnny Castle and Jennifer Grey as Baby Houseman.. Nobody expected that this low-budget film about a 26 year-old dance instructor who fell in love with a 17 year-old rich girl, will make it to be a classic and eventually, a broadway musical produced.. I really love this film and I can say one of my favorites.. I love how they were able to incorporate the dancing, music and characters so well, I just love everything.. It showed how well Patrick and Jennifer can dance and act.. To think that they played characters who were both 10 years their junior.. 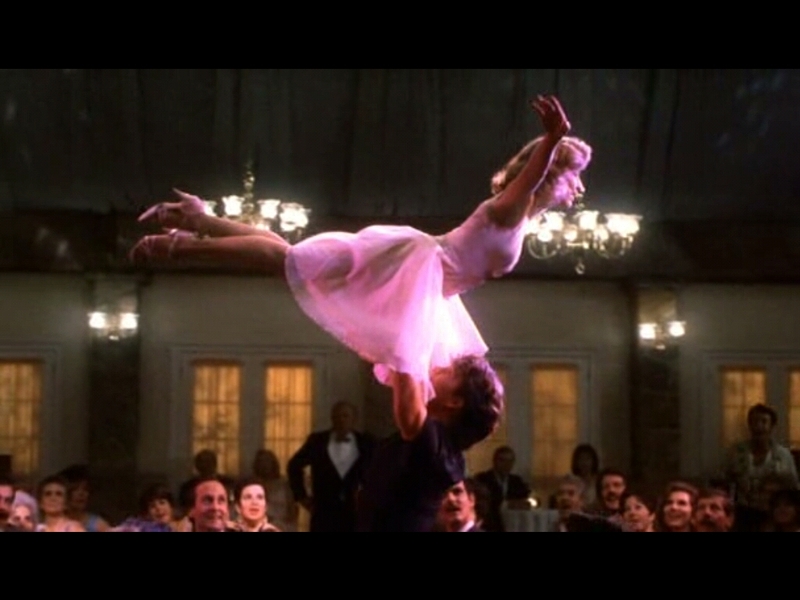 Yes.. Patrick Swayze was already 36 when he filmed this and Jennifer was 26.. I would say this is not really a movie to be seen by teeners as the content is really kinda daring for me.. A 17 year-old girl who fell in love and slept with him a couple of times is somehow really not my cup of tea.. But the dance routines were beautiful and perfectly executed and the daring part can easily be forgotten once you see them danced.. I was so excited when they announced last February that the broadway musical will perform here in Manila in July.. And I even planned it with my friends that we would all watch it together.. But my heart was crushed when in May, they suddenly informed everyone that it was cancelled.. They never said the reason why.. 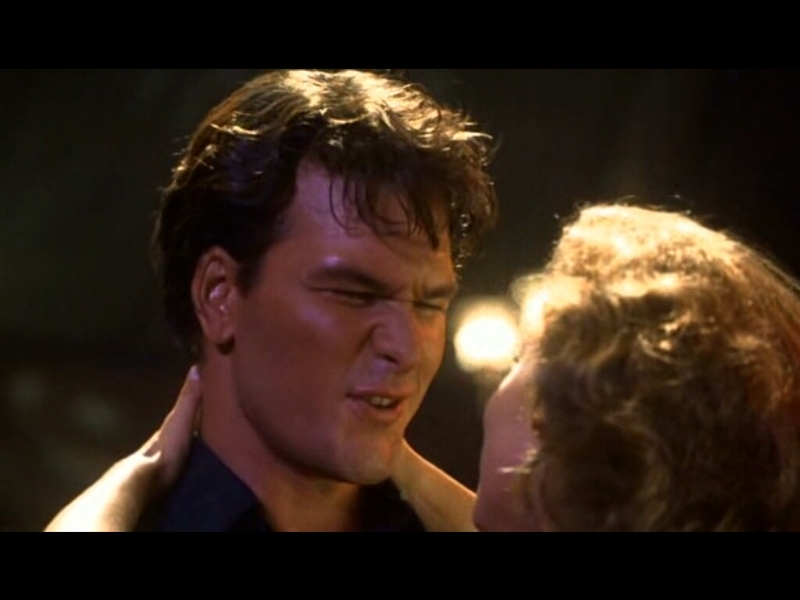 Anyway, Dirty Dancing is really worth watching even a hundred times especially the last part when Johnny Castle took Baby on stage and danced and finally she was able to do the lift.. It’s just so sad that Patrick Swayze is already gone now but at least he had this movie and Ghost under his sleeves as classics..